The Hamanako Service Area is one of popular service areas in Japan and is located at the midpoint between Tokyo and Osaka. 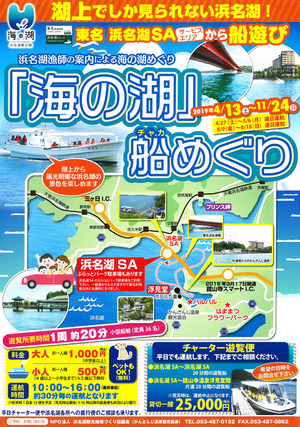 This is the only place in Japan where you can enjoy cruising from a service area! For a limited time only, this boat sails with the guide of local fisherman. The voyage takes about twenty minutes and travels by rough rocks which was used for the stone wall of Hamamatsu Castle, to Uchiura Bay where you can see the seasonal scenery of Tateyama/Ohkusayama, and it also goes under the big red bridge of Tomei highway to Lake Hosoe where you can see Mt. Fuji when the sky is clear. Cancellation may occur due to inclement weather such as severe wind. Sat, Sun, holidays and G.W between 2017/4/23 sun - 11/26 sun. [CAR]　Tomei Expressway - Between Mikkabi I.C. and Hamamatsu-Nishi I.C. [Local roads]　Accesible by a car or a bicycle through Puratto park.